I recently spent 2 days shopping, learning and connecting with friends at Sew Expo, a 4-day event full of learning, shopping and inspiration for sewers of all kinds and levels. My last trip to Sew Expo was about five years ago when Marcy and Katherine Tilton, Sewing Workshop and McCall Pattern Company still had booths at the show. Knowing they were gone, and hearing from friends that the Expo was now all about quilting, I wasn’t in a hurry to go back (I have been a quilter, but not anymore). Yes, quilting booths dominate, but there are definitely vendors and workshops with appeal for anyone who sews. Those quilting vendors offer some great tools and Marcia Derse, a quilting fabric designer, has some of the most interesting “graffiti” style quilting cottons that would make fun garments. My friend, Bev, and I arrived at the fairgrounds about 10:00 a.m. on the 2ndday of the Expo. We were lucky to find a parking spot on the street near the Gold gate – close enough that we could easily walk our purchases to the car when we tired of carrying them. If you aren’t as lucky with parking, you can check coats and bags at the fairgrounds for a small fee. Our first stop was the L’Etoffe Fabrics booth, a small fabric store in Springfield, Oregon. Owner, Ina Mounir, offers a well-curated selection of fabrics and trims, as well as patterns from the French company, DP Studio. On to Professional Sewing Supplies, purveyor of fine (and hard to find) Japanese sewing tools and supplies. Hisako and her husband have been importing and selling these supplies from their Seattle home for over 25 years. They have plans to go online soon, which would be great news for sewists everywhere. We made quick stops at Billie’s Designer Fabrics (Chehalis, WA) and The Wool House (Toronto, ON, Canada) before heading to our first 45 minute seminar, “Enchantment with Fabrics and Tsukineko Ink”, with Joyce Teng. Joyce talks fast and packs plenty of information into her seminars. Her techniques have appeal for quilters and sewists interested in surface design with non-toxic materials. Her samples were stunning and we both bought her more detailed “how to” book for $10.00. After lunch we headed to Vogue Fabrics, a Chicago fabric store that brings a very large truck load of fabrics to Expo each year. They are by far the largest fabric vendor at the show and you have to be willing to do some deep digging to find their special offerings. I found a beautiful digital linen print that was gone the next day. It pays to shop the fabric vendors early! We wandered the vendor aisles for the rest of the afternoon, taking in as many vendors as we could. I was pleased to see so many independent pattern companies with booths. They always have sample garments on view and those samples never fail to reframe my opinions of patterns I might otherwise have passed over. We had purchased tickets for the Friday evening keynote speaker/fashion show featuring Angela Wolf, fashion designer, hostess of the PBS TV series, “It’s Sew Easy”, and spokesperson for Brother and WAWAK sewing. The fashion show was well done and featured some interested techniques, but the styles were definitely designed for younger sewists. There was a fun surprise guest for the runway finale. She was Daniela Gschwendtner, costume designer for the popular TV series, “Dancing with the Stars”. She talked about the process and challenges of producing elaborate costumes for dancers with only a 6 day turnaround. She brought down the house when the models strutted down the runway modeling a dozen of the sparkly and skimpy costumes! We began the day with Louise Cutting’s seminar, “Fit, Fit, Fit: What do You Want to Fit?” Louise has been in the sewing, pattern design and education business for a long time, so she knows her subject and is an entertaining teacher. I always come away from her seminars with valuable information and attend her workshops whenever I can. Before heading to our second seminar of the day, we re-visited our favorite vendors, running into a number of sewing friends. Nothing beats the camaraderie shared by the sewing community! Our next seminar, “How to Choose Fabric, Patterns and Styles to Sew that Flatter Every Body”, with Anne and Bruce Whalley, was pure fun. Anne, known as the “Pattern Whisperer”, and her husband hail from Australia. Anne loves color and pattern and had lively garments to illustrate her encouragement to let clothes reflect your personality. Anne called this her “Fraggle Rock” dress! Prior to our last seminar of the day, we took in a portion of the American Sewing Guild fashion show. Sadly, we weren’t in a spot that allowed for good photos, but after seeing the skill and creativity of some of the younger members in the show, I’m sure the future of the ASG is in good hands. Our final seminar of the day, and probably my favorite, was “How to Pack for a Quick Vacation in a Carry-On Bag” with Sandra Miller. Sandra is a writer for Threads magazine, works with Louise Cutting and travels often. This 45 minute seminar was packed with practical ideas for choosing color themes, sewing a coordinated wardrobe for any climate and safety tips for airports. She showed samples of travel wardrobes and how the garments could be interchanged to make many outfits. Bring your own food unless you don’t mind fast food, i.e. pizza and burgers. There is a good espresso stand outside the Pavilion. Brig a refillable water bottle and remember to drink the water. If you plan to stay overnight, we were pleased with the Fairfield Inn and Suites on 15th, just a few blocks and a comfortable walk from the fairgrounds/expo center. Our room was comfortable, breakfast was included, and we were able to leave our car in their lot after we had checked out in the morning. I always welcome a new year and the fresh start it represents. I’m not a fan of resolutions and have tried selecting a “word of the year” to guide me, with mixed results. This year my husband and I tried something new – we headed to the Oregon coast for a long weekend to plan and create some goals for the year. We will definitely make this an annual event. The time away, without everyday distractions, yielded great conversations and energized us for the year ahead. All my shoes, with the exception of boots, fit on my shelves now. The big basket on the floor used to be full of shoes – it now contains one pair of flip flops and one pair of trainers. There were several shopping bags of knitting projects on the top shelf, so I ended up going through all my knitting. Each project is now in its own box up there. The shelves between clothes racks have empty spaces and clothes aren’t crammed in. The closet feels more spacious and it’s easier to see what I have. I’d like to pare down even more, as I figure out what I like to wear day in and day out, so plan to do this twice a year with the change of seasons. Now I need to figure out my approach to step 2: planning a coordinated wardrobe. 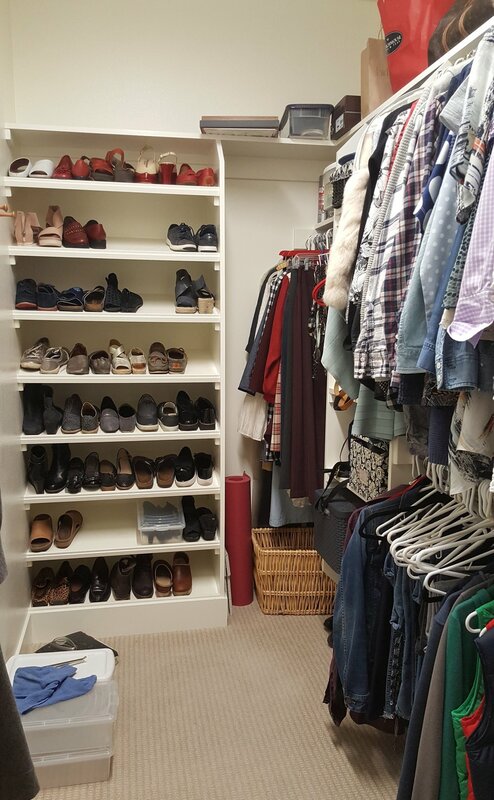 Do I want to try a capsule wardrobe or would it be too limiting? I’ll be reading The Curated Closet to see what wisdom I find there. Readers, let me know what wardrobe-planning tools have worked for you. Whatever I do, I know I want to incorporate quality, sustainability and slow fashion principles. I’ll let you know what direction I go in my next post. Last month I was in Seattle doing some shopping with my son. Walking by J. Crew, we decided to pop in for a quick look. After all, everything was 30% off. I spotted a floral t-shirt in my favorite shade of blue so, without much thought, I bought it. Back home in Portland, I pulled another J. Crew t-shirt, purchased earlier this year, out of a load of delicate wash and hung it to dry. When I went to fold and put it away, I discovered the front had multiple tiny holes in it. I had worn it maybe a dozen times since purchase and the fabric was already disintegrating. I returned my new floral t-shirt and vowed to sew all my t-shirts in the future. Coincidently, I found a used copy of Overdressed: The Shockingly High Cost of Cheap Fashion about this time. This book has been on my radar for several years; the time for reading it seemed right, given my experience at J. Crew. What I learned has changed the way I shop for clothes and fabric, filled me with gratitude for my sewing skills, and sent me on a quest for quality in my closet. Most of us don’t know the answer because we haven’t experienced garments made of quality fabrics and techniques. Very few quality garments are produced any more. We simply couldn’t afford quality garments if we could find them, and for good reason. Those garments are made of the finest fabrics, in factories that pay a living wage or better and have finishing details requiring hand sewing and hours of labor. When it comes to quality, the best fabrics were milled in England and Italy (still are) and many fine cottons were milled here in the south. Synthetic fibers were rare. Men and women used to buy fewer clothes, but the best they could afford. They knew about fiber content and could feel the difference between quality and inferior cloth. If you have been fortunate to handle Liberty cotton, you could surely feel the difference between this fine fabric and inferior cottons. Finished garments of quality deserve a closer look. Inside you will find French or Hong Kong seam finishes, linings in jackets, skirts and pants, blind hems, covered snaps, etc. Outside you will find design details like tucks, pleats, matched plaids, covered belts, ribbon, lace, soutache braid or other trims - details that are too costly in today’s fashion market. The simple answer is fast fashion. The rise of fast fashion seems to have started with the social upheaval of the 60’s. Rebellious youth weren’t interested in the fashion dictates of seasonal fashion collections. At the same time, sportswear became popular with its offerings of lower cost separates. People moved away from making their own clothes in favor of buying cheaper clothing. Consumers began losing their knowledge of quality construction and materials. Fast fashion retailing broke away from seasonal selling to meet constant demand for new styles. As most of us know, clothing manufacturing moved off shore to meet the demand for lower prices. To keep prices lower, fabrics have become thinner, more synthetic fibers are used and quality control is almost non-existent. Oversight takes time and slows down the fast fashion cycle. I can’t write on this topic without touching on the human and environmental costs of fast fashion. Undeniably, the clothing industry is labor intense; typically, 20-40% of a garment’s cost is labor. It’s no wonder cheap labor has driven garment production overseas, causing staggering job loss in the U.S. News accounts have highlighted deadly fires in overseas factories where workers are rarely paid a living wage and work inhumane hours in toxic environments. The environmental costs are not only unhealthy, but unsustainable. The EPA estimates Americans throw away at least 12.7 million tons (68 lbs. per person) of textiles each year. At one time 3rdworld countries were happy to receive our cast-offs. As clothing has become cheaper, they can now afford new clothing. Some of our discarded clothing can be recycled, but about half of our wardrobes are now made of polyester, which is recycled plastic. Landfills cannot continue to absorb our textile waste. The microscopic polymers found in synthetic fabrics like polyester, nylon and lycra are released into our lakes, rivers and oceans whenever we do laundry. The toxic chemicals and dyes used in producing these fabrics are polluting soil and water unchecked in manufacturing countries where there is no awareness or money for clean-up. Sew what can we do? Those of us who sew are the lucky ones. We have choices not available to everyone and our choices can effect positive change in the clothing industry. We can make and wear better quality clothing than we can find or afford in stores. By choosing to sew with natural fibers, organic textiles, or otherwise high-quality fabrics, our clothing can be nourishing. We can create demand for ethically produced, quality textiles by educating ourselves about fibers and where they are milled and purchasing the best we can afford. There is a greater cost to quality, but we can choose to own less. With our knowledge, we can look for quality garments to refashion and recycle. We can mend, repair and extend the life of our quality garments, shoes and bags. We can educate our children to appreciate quality, understand the costs of fast fashion and to be content with less. I encourage you to get to know them and their offerings. In this final post from my spring travels to Europe, I’d thought I would share some of my favorite resources for wardrobe planning, packing, and a few more miscellaneous resources from my Paris and London travels. Brenda Kinsel. Brenda is a wardrobe consultant in California, one who writes from the heart and knows fashion. I use her travel checklists (under the “Resource” tab) for all my travel now. Once I’ve filled out the wardrobe plan chart, I follow her advice to make a copy and keep it in my carry on. This way, if my luggage is lost or stolen, I have a complete list for insurance claims – very handy! Une Femme d’un Certain Âge. Susan travels often and provides capsule wardrobe ideas with links to the garments for purchase, luggage reviews, and shopping info for cities she visits, especially Paris. Our best dining finds came from David Liebovitz, an ex-pat food writer and former. Alice Waters protégé living in Paris. Oh, my, it’s hard to know where to start on this subject! The second special collection was titled Dress of the Year 2017. According to Wikipedia, “The Dress of the Year is an annual fashion award run by the Fashion Museum, Bath from 1963. Each year since 1963, the Museum has asked a fashion journalist to select a dress or outfit that best represents the most important new ideas in contemporary fashion.” The collection included previous winners, as well as the 2017 winner from Dior. These were some of my favorites from the entire collection! Dress of the Year 2017 is an ensemble from Dior’s Spring-Summer 2017 collection. It showcases the white cotton “We Should All Be Feminists” print T-shirt. The T-shirt is worn with a black wool jacket and black tulle skirt with black knitted underwear. As you can imagine, there is plenty of great shopping in London! I am going to introduce you to two of my personal favorites, Joel & Son Fabrics and Selfridges Department store. Joel & Sons Fabrics got its start in 1940’s post-war London as a market stall selling surplus parachutes cut into pieces. The business eventually grew to several market stalls, then finally opened at its current location on Church Street in 1979. It is now one of the leading fabric retailers in the world. You know you are in for a treat as you pass its windows on the way to the main entrance. Inside you are greeted by floor to ceiling luxury fabrics from around the world. I had no idea where to begin shopping! Selfridges is a department store like no other! It is full of luxury goods, beautiful displays, etc., but what really sets it apart are the employees. I could personally not afford to purchase much of anything there, but the staff are friendly, never pressure you to buy, and allow you to wander and look without feeling “supervised”. They were also very gracious about allowing me to take photos, so let me treat you to some of my favorite fashions. Some of you may have seen the fictional BBC series about Selfridges, but there is also a wonderful documentary about the founder and history of the store with footage from its construction interspersed with scenes of shoppers in the store today. The history is fascinating and the program can be found here: https://www.netflix.com/title/70296574. To see their offerings online, go here: http://www.selfridges.com/US/en/. I found myself in London at a time when both the Victoria and Albert Museum and the Design Museum were hosting special, and diverse, fashion exhibits. The Victoria and Albert Museum’s Fashioned from Nature exhibit celebrates all the ways nature has inspired fashion from embroidered motifs to fantastical imagery on fabric. However, the exhibit also explores the impact of the fashion industry on nature and our planet as a whole. Fashioned from Nature challenges us, the consumers, to be more thoughtful about our own choices when it comes to clothing and fashion. The garments in this exhibit span a 400-year period, so there was an enormous number of them. I thought I’d share a few of them with you. Vivienne Westwood – early 70’s British designer influenced by punk. The Leopard skin portion of the gown on the right is crafted entirely out of beads and took over 1000 hours to make! The grid pattern of this unisex suit represents an aerial view of hedgerows with tufts of sheep’s wool caught in the hedges. The fabric in the photo on the right combines an 18thc. European landscape with a contemporary photo of Puerto Rico! The Honest By company is the first in the garment industry to provide 100% transparency by publishing the full details of each garment – its suppliers, manufacturers and time and cost of each garment. The shoe above are from Masaya Kushino, a one of a kind pair, inspired by Japanese artist Ito Jakuchu’s bird paintings. Claw heels sculpted by Atsushi Nakamura. The Design Museum’s Azzedine Alaïa: The Couturier is the first solo exhibition of Monsieur Alaïa’s work in the UK. Azzedine Alaïa was born to Tunisian wheat farmers in 1935. He became interested in art and design at a young age, eventually moving to Paris where he went to work for the house of Dior. Always an industry outsider, showing only when ready, he introduced his first collection in the late 70’s. He went on to discover the famous model, Naomi Campbell, and made garments for Grace Jones, Lady Gaga, Tina Turner, Scarlett Johansson and Michelle Obama. We decided to preface my husband’s work week in London with a vacation week in Paris. This was our second trip to Paris and very different than the first one, 15 years ago, with our 10 year old daughter along. Her priority was a trip to Euro Disney and there was a lot of grumbling over the leisurely meals. On this visit, we checked into Hôtel La Perle, a lovely boutique hotel in the Saint Germain des Prés quarter of Paris. Imagine my surprise when I discovered the Tilton sisters (Marcy and Katherine, Vogue pattern designers) were in our same hotel for the week with their Paris tour group! I enjoyed seeing what these fashionable women were wearing each morning at breakfast, especially the garments they had made themselves. Overall, Parisian women are dressing more casual than I remember from my previous visit, although they are never “sloppy”. They still put thought and care into the way they dress. I did not take any jeans with me on this trip and enjoyed dressing up a bit more than I do here in Portland. I found I felt really good about myself when I had taken some time to pull together a nice outfit. We are lucky here in Portland, in that “anything goes” when it comes to fashion. For me personally, I intend to “up my game” a bit after this trip! With spring in the air, we’ve been busy getting new spring and summer fabrics in stock, priced and ready for your shopping pleasure! This is also a great time to feature Bini’s tried and true favorites, as they are perfect spring and summer casual basics to add to your wardrobe. Playful and fun, Bini’s favorite patterns are easy to wear and provide a canvas for the variety of fabrics Josephine’s has to offer. She loves to combine prints, dive into her stash, and make use of a one yard piece of Libery of London cotton whenever she can. This first tried and true pattern is a self-drafted tank top with bias binding. It requires just one yard of fabric in size small. Ask Bini about tracing this pattern to try for yourself! Come see more samples in the shop. Some favorites from Bini's Tank Top Class! Making a year round favorite is a fun way to jump into Spring sewing!! A Liberty of London and lace combo for one of Bini’s signature tank tops. Another staple in Bini’s wardrobe is the Burnside Bib pattern from Sewhouse Seven. This is a pattern that can be made from many different fabrics to suit the season. She has made versions in wool, cotton and linen. The pair pictured below right is made in a charcoal gray wool. Bini is so fond of this pattern that she made a pair in linen for her sister-in-law and co-owner, Dana! The Burnside Bib and other Sewhouse Seven patterns are available at Josephine’s. If you are in the Portland area, please stop in and share your own tried and true patterns! Sewing is normally a solitary pursuit, like many creative endeavors. In the past, women would gather for quilting bees to share their love for sewing, the latest news, and homemaking tips. Today we can sew communally by getting away on a sewing retreat. I recently returned from a week in Ashland, Oregon where I attended my first Design Outside the Lines Retreat hosted by Diane Ericson, with guest instructor Kathryn Brenne. The theme for this fall retreat was “It’s all in the Details: Coats & Jackets”. Diane is a gifted teacher, artist and designer. She is all about expressing your own creative sensibility in the garments you make and wear. She blogs and offers her patterns, stencils etc. on her website, http://www.dianeericson.com. Kathryn teaches couture sewing at her Academy of Fine Sewing and Design near Ontario, Canada, and designs patterns for Vogue Pattern Company. She also writes articles for Vogue Patterns and detailed sewing tutorials for Emma One Sock, an online fabric retailer, which can be found here. The two of them made a complementary and dynamic teaching duo. Each day of the five day retreat combined demonstrations by Diane and Kathryn, sewing time for our individual projects and time to explore the charms of Ashland. The town offers plenty of shopping, art galleries, restaurants, and, of course, Lithia Park for inspiration. In the afternoon, Diane talked about making fabric better. How can fabric possibly get any better? Well, she showed us how she fuses or stitches pieces of fabric together, then cuts the resulting fabric into the desired shape or size. This pieced fabric can be used for embellishment or an entire garment as shown below. Diane dazzled us with shaped seam construction, interesting collars, and ways to add shape to a garment with godets. Her motto is “do more with everything” as you can see from the photos below. I thought I knew a fair amount about needles and thread until Kathryn shared her tips for matching the right needle and thread to various fabrics and applications. Other couture tips, like knotting, thread tracing and choosing/applying interfacings completed our afternoon session. This was a full day of learning to make wearable art jewelry from fabric scraps and found objects, as well as working with leather to make “one of a kind” closures. By the end of day three, our own projects were well underway and our heads were so full of ideas that sleep was hard to come by! Stay tuned for DOL, part 2, for the final few days of this wonderful getaway. but I envision the Grainline Tamarack jacket in one of these wool/Liberty of London combinations. Another favorite is the zip front Minoru jacket with its wide collar, optional hood, raglan sleeves and flattering elastic waist – perfect in our cheerful Liberty Capri canvas. From Vogue’s new fall patterns, comes the sporty, ¾ length version of the baseball jacket, V9275. This pattern is perfect for one of our Italian wool plaids or checks. If you are a novice at matching checks/plaids or just want a refresher, this tutorial from Grainline Studio is a great reference and will insure your success. Do you have a coat project underway? We’d love to see what you are sewing and are here to help whenever we can. You are always welcome to come sew on our Bernina machines and get our assistance. Open Sew studio time is available by the hour or with a discounted punch card. Reasons to Take a Sewing Class, continued! Many experienced people choose to join sewing groups because they are looking for inspiration and want to help others learn how to sew. Even someone who has been sewing for years can benefit from spending time with others who share their hobby. Making crafts for yourself and for gifts is fun and affordable. You can give them away as gifts which save money, but you can also sell them to make money, as well. Learning to sew will leave you never having to rely on a seamstress to do alterations for you or your family. You can save money by doing these alterations yourself. Joining a Portland sewing class is also a great way to learn the basics. You won't have to jump right into using a sewing machine, either. You'll be able to learn hand sewing and other techniques before moving onto the machine. Joining a class helps you meet new people! When joining our sewing class, you’ll find individuals just like you, learning to sew and gaining knowledge. If you learn to and then like making alterations you can turn it into a side business. This will be a good way for you to keep working on your craft and make money at the same time. Reasons to Take a Sewing Class! Have you been thinking of taking a Portland sewing class? If so, now is the time. Our fabric shop is proud to offer new classes for all types of sewists. From beginners to more experienced, you'll find something for everyone. If you're having trouble committing to a class, consider the following benefits and reasons why a Portland sewing class would be great for you! Creativity is a great way to keep life interesting. Why not take a sewing class so that you'll be more encouraged to create? Making your own outfits, quilts, tablet holders and more are great ways to express your creative side. You'll be able to make wonderful gifts for friends and family along the way during the class and once you’ve become more experienced! At times, we need a creative outlet to help us relieve stress and relax from work or life. Learning to sew is a great way to do this. It’s fun to choose various types of fabrics, patterns and make anything you'd like. Our fabric shop has all the luxurious and beautifully made fabric you'll ever need when taking a class and venturing on your own! As a beginner, you won’t have to struggle with not understanding how to start sewing. You won’t even wonder where to find tools or what materials you might need to begin your journey. The class will go over everything you need to get ready for creating! Taking a Portland sewing class might be the encouragement you need to start learning your new hobby. Trying to learn on your own might be overwhelming and difficult. However, with a classroom full of beginners just like you, you will be encouraged and inspired! We hope this information inspires you to sign up for the next Portland sewing class in your area! With gorgeous fabric just waiting for you to create with it, you’ll be happy to learn how to sew and meet new people in the process! To learn more benefits of taking a sewing class, visit back with our next blog soon! We are proud to offer you a way to bring your visions for projects to life both at home and in our Portland sewing class! We hope you'll join us for an upcoming learning session, soon. Contact us if you have any questions about our fabric, accessories or Portland sewing class offered by Josephine's that we also offer. We strive to inspire your creativity with the highest quality fabrics and classes in the area. We are here, once again to list out more fashion magazines all over the world! We love to look at different looks in the magazines to see what type of fabric in Portland is being used! Designers have ideas that we can use for inspiration and recreation! We are back with our final list of fashion magazines that are published all around the world! If you missed previous blogs, visit back with them for even more lists! Who knows when you'll be inspired by the fabric in Portland OR found within their pages? One of the most difficult parts of having sewing as a hobby is to continually find inspiration and ideas that help you create beautiful projects. For those that love creating garments to wear and staying in fashion, we have compiled a list of all the great fashion magazines all over the world! These magazines are great for helping us all find new ideas and projects we'd like to try, in addition to staying up-to-date with all the trends! Be sure to read over the list below, as well as check back regularly to see more of our list in other blogs! Sign up below to receive notifications when new information is posted. We'll be announcing VIP sales and other insider information here so be sure to check back for updates! Thank you for subscribing to our blog! You'll receive an email when we post new information!